You may have noticed that there haven't been very many new recipes around here lately. But it's not because I haven't been cooking. I've actually been cooking quite a bit. The recipes I've been working on have been for a wine retailer so I haven't shared the results here the way I usually do. Now that one of the recipes is up on the client's site, I thought I'd go ahead and reprint it here. 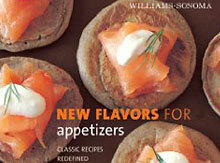 It's a fun challenge pairing recipes with wines. You can plan all you like, but ultimately you just have to taste your dish with the wine and see what develops. Sometimes one element can throw the whole thing off. Other times it just sings. When I learned I would be pairing a dish with a Pinot Gris I decided I would put together a seafood salad. I was very lucky that the dressing only took a couple of tries to get right. Even though I created this recipe almost two months ago, the ingredients are perfect right now. In fact my organic produce box, delivered from the farm this week, featured two of the main ingredients, avocados and arugula. I also happen to have a couple of Meyer lemons on hand and maybe you do too? If you are looking for an elegant salad, I hope you will enjoy this one as much as I did. Make the vinaigrette by whisking together the salt, honey, garlic, lemon juice, lemon peel and olive oil. Peel and de-vein shrimp. In a small bowl toss shrimp with salt, a couple grinds of pepper and olive oil. Place shrimp on a baking sheet lined with tin foil. Bake for 4 or 5 minutes or until pink and cooked through. Toss the salad with about a 1/4 cup of the vinaigrette. Divide salad greens onto four salad plates. 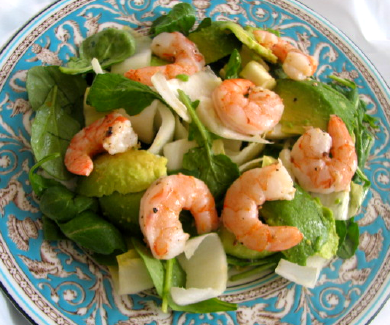 Scoop out bits of avocado using a teaspoon and place with shrimp on top of the salad.